A Greek sponge fisherman and his son (Mike and Tony Patrakis) dive for sponge off the coast of Florida and find themselves in competition with the Rhys Family, another fishing family who are prepared to use violence to protect their established fishing grounds. 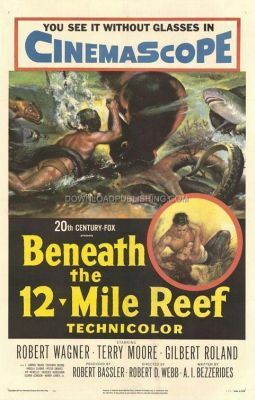 After bringing back a boat load of sponge, they are robbed and Mike decides to take his crew to the dangerous 12-mile reef where he knows there are abundant and huge sponges. During run-ins between the two clans tony meets Gwyneth Rhys, the daughter of the Rhys clan, were eventually they fall in love.